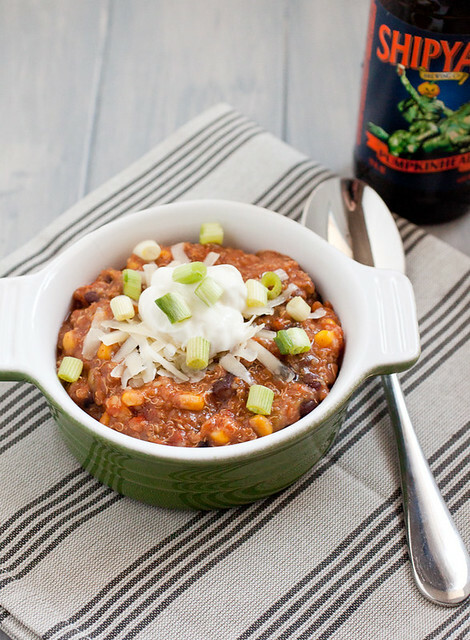 I mentioned last week that I’ve got a few more warm, cozy, and quick weeknight meals lined up for you during this busy holiday season, and this vegetarian quinoa chili that popped out of my slow cooker a few weeks ago is definitely one of them. It’s the type of slow cooker recipe where there’s no prep – just toss everything in, set the time, and go about your day; my favorite kind of recipe! I was a little leery about what Kyle would think about a vegetarian chili but he loved this as much as I did. Filled with protein from quinoa and black beans, this is one healthy meal that will take us through the winter when my time is short and the craving for hearty chili is strong. Add all of the ingredients except for the salt, including only 3 cups of broth, to a 6-quart slow cooker and cook on low for 8 hours. If the chili is very thick, stir in up to one more cup of vegetable broth to loosen the chili. Heat for an extra 5-10 minutes on high. Season with salt to taste. Top with your favorite chili toppings.